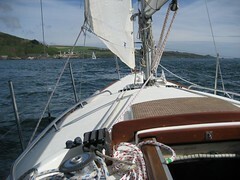 We finally went to sea on Saturday afternoon – Pete and I. 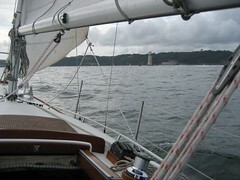 A run to stretch the sails and check the rigging. I had planned to go on Friday but the weather dictates – and this year it is dictating more than average. 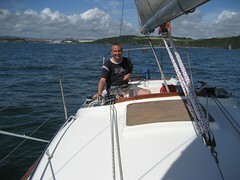 It seemed that most of the boats in Plymouth were taking advantage of the sunny day. The deck proved good to work on. The Folksong deck is uncluttered anyway, but painting it this colour with an uninterrupted non-slip surface makes it seem large. Also, placing the grab-rails around the edge of the coach roof has kept the coachroof free to walk on. They make good toerails when sitting full on the deck, and are not too high to sit inboard with feet on the toerails proper. The wind was dropping as the afternoon wore on. It was really a genoa wind but I wanted to try out the No.2 jib. 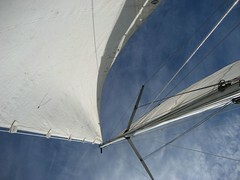 This is a heavier sail and cut differently from the others. It also stretches the full height of the forestay, whereas the luffs of the other sails are shorter and their tacks can be raised with a strop to make visibility easier. Blue Mistress handled well but it kept her speed down and I felt a hint – (just a hint), of a need to compete when we joined the line of yachts returning in the early evening. We had sailed gently along the outside of the breakwater towards them, gybing round the lighthouse on its western end, just as a Contessa 26, a boat I remember admiring last year, powered by with spinnaker set. We have a lot more to do before we can look in that direction.